Last year, Hasbro offered an exclusive series of figures to market six stores. This year, they offered repaints of those same figures. 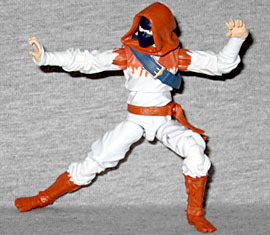 For instance, last year we got a Storm Shadow wearing black and white - this year we get that selfsame Storm Shadow wearing white and orange. T'Gin-Zu was the best martial arts student Storm Shadow ever taught. He studied the martial arts for over 20 years until he earned the right to be called a ninja master. He learned some of the guarded secrets of the Arashikage ninja clan, especially those dealing with covert operations and various techniques in self-discipline and endurance training. During his first week as part of the Ninja Force, T'Gin-Zu volunteered to be a Ninja Raider driver. Since then, he has clobbered Cobras across the globe in his pursuit to capture the entire band of Cobra's Red Ninjas... alone!!! Now, clever readers will have noticed that biography isn't for Storm Shadow. And readers with astoundingly good memory will recall that these "dollar store" Joes don't have filecards anyway, so it doesn't really matter. Why did we reproduce that one, then? Because no matter what the packaging says, this isn't based on Storm Shadow. It's like Short-Fuze all over again. Just like last year's Storm Shadow, T'Gin-Zu is kitbashed from the body of one Storm Shadow and the head of another, with a hood taken from Zartan. The hood doesn't fit very well (it floats above his shoulders slightly), but this is still a nice combination and definitely better than the alternative (new sculpts with only five joints). As we said above, this figure is white and orange. The paint masks are the same used for the previous dollar store Storm Shadow - so the specific shape of the border between the colors is identical, but the colors themselves have been switched around. 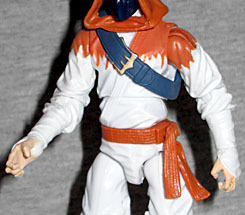 His "specialized camouflage battle uniform" is mostly white, with the orange constrained to the hood/shoulder area, the shins and "soft-tread foot wraps," and his sash. The strap around his torso is grey-blue with a golden buckle. His mask-- sorry, his "steel-threaded concealment mask" is even darker, and what little exposed skin he has is pink. This figure's connection to T'Gin-Zu is more tenuous than the other figures. The Generation 1 figure (released in 1993) used the same molds as the 1992 Storm Shadow that inspired the first dollar store Storm Shadow, so we start on pretty solid ground. But if you look at the figure, he's all-white, with an orange belt and mask, and blue details on his chest; suddenly this paintscheme isn't looking so accurate, is it? Ah, but T'Gin-Zu was a vehicle driver, and if you look at the art of him on the Pile Driver box (and the prototype figure), it does exactly what this figure does: uses the same paint masks as the Storm Shadow that inspired it, but changes them to white and orange (and also yellow for the chest details, but you can't have everything). That's a pretty amazing move on Hasbro's part, especially since the one time he ever appeared in the comics, he looked like the art rather than the toy. 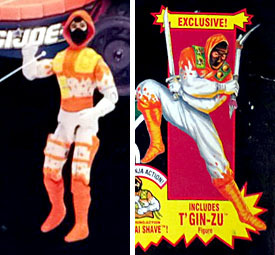 T'Gin-Zu was part of the "Ninja Force" subseries, which meant he had a spring-loaded action feature. His was a two-handed punching motion (which the instructions called "the Samurai Shave"). Obviously this figure doesn't have that kind of silliness, but he's got enough articulation that you can fake it if you want. In addition to the standard G3 Joe joints (balljointed head, swivel/hinge shoulders, elbows and torso, balljointed hips, double-hinged knees, and swivel/hinge ankles), he gets peg and hinge wrists with splayed fingers that can hold accessories in a number of innovative ways. Sadly, he doesn't get much to hold. 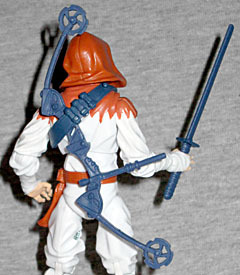 In addition to the removable hood, sash, and belt, T'Gin-Zu comes with a "razor-sharp steel Katana sword," Shadow Tracker's compound bow, and a base. The base is the typical Generation 3 base, with a Cobra logo (despite T'Gin-Zu and the Storm Shadow he's based on both being members of the Joe team). It also doesn't feature the character's name anywhere on it. His bow and sword are greyish blue plastic, with no paint apps, and while he doesn't get a scabbard, you can slip the gear into his sash to keep it stowed. T'Gin-Zu was the codename of Joseph Rainone, from Somers, NY. That's a surprisingly whitebread origin for a Japanese ninja, but it's also appropriate: the character is named after the famous Ginsu knives, star of many a late-night infomercial; but "Ginsu" doesn't actually mean anything in Japanese; they were originally known as "Quikut" knives, and were only given their present name to make them sound exotic. He's an American product with a pseudo-Asian name? How fitting! These repaints are just starting to show up at Dollar General, though they apparently popped up at Marshall's/TJ Maxx a few months ago. My local stores are still pretty well-stocked with the first wave, so I ended up ordering T'Gin-Zu from Will's World of Wonder, because it beat going to seven different Dollar Generals every week hoping Orange Storm Shadow hadn't already been taken.